Clearly I’m out enjoying the summer instead of writing blog posts. Here’s some summer reading for you. I mentioned in my Choosing An Agency series that you should ask an agency’s policy on pregnancy during the process because some don’t let you continue if you should become pregnant. One agency with this policy writes about their reasons for having it. NHBO features a story from a parent who experienced a difficult transition after adopting an older child but through a long road of hard work was able to integrate their daughter into their family. Elizabeth Curry has blogged her annotated reading list on trauma. It’s such a wonderful resource that I added it to the updated version of my book. If you are looking to expand your knowledge beyond The Connected Child, look for suggestions here. Holt’s blog featured a look at life in an area of northern China where the poorest people live in caves. It’s a feature story geared towards increasing child sponsorships through their agency but I found it interesting reading, regardless. Another WACAP blog post breaks down waiting children by age, special needs, and addresses other issues such as trauma. Kudos to them for moving beyond the kind of “orphan problems would be solved if everyone brought home one adorable baby” stereotype that I often see from agencies. Andrea Olson guest blogs at NHBO about their family’s preference to adopt a girl and how that changed over time. NHBO also had a great interview with Amy Eldridge of Love Without Boundaries. Be sure to read Amy’s thoughts on care packages. Many families are caught off guard by oral adversion–feeding difficulties that often come with older children who were never fed solid foods. NHBO has a detailed personal experience here. As I have mentioned before in my post on considering which special needs to be open to, few parents are open to needs which involved disordered sexual development. This family shares their personal experience in adopting a child with the special need of ambiguous genitalia which later turned out to be diagnosed as hypospadias. On the Holt blog you can read interviews with children who were adopted at an older age about what that experience was like from their point of view. Since China is requiring more couples have a psychological evaluation now, I wanted to share the website of a doctor recommended by many in the adoption community who does distance evaluations quickly for a reasonable fee. The Donaldson Adoption Institute discusses dissolutions prompted by the State Department’s 2015 report which showed that 59 children adopted from other countries ended up in state care. Speaking of which, the 2016 report is now available. The Economist has an article discussing the Han majority and Chinese identity. At Adoption.com the article Meeting Your Child discusses typical reactions of children on adoption day. A gallery of Qing Dynasty photos from China before the Communist revolution. Finally, thanks to Rainbow Kids for featuring the Post Adoption Documents post on their website. This entry was posted in Uncategorized and tagged What I'm reading on June 13, 2017 by minefam. Allison, who wrote a guest post for me on adopting an older child, has posted a 4 month update on her blog. The adoption agency EAC has shut down after being debarred from adoptions for the next 3 years because of ethical violations. What’s the Big Deal About Birth Order? on MLJ Adoptions is a great read for those considering adopting out of birth order. At The Chronicle of Social Change, a discussion of how more adoptive parents are becoming aware of the need to secure documentation for their internationally adopted child in light of the new immigration policies. Because the US State Department has received such a high volume of inquiries from adoptive parents, they have issued a notice with information clarifying a number of adoptive immigrant citizenship issues. From the Metropolitan Museum of Art’s collection, a series of hand colored photographs from 1870’s Shanghai. All Things Considered looks at how scientific research has revealed that institutionalization causes changes to the brain. It primarily focuses on Romanian orphanages, but the information will be relevant for those from China as well. In Foreign Policy magazine, a young woman compares her life after being adopted by an American family with that of her orphanage friend who was not. You can read a similar article about the same young women at Sixth Tone with many more additional pictures. MLJ Adoptions has a great post explaining what post placement reports are and why you should complete them. WACAP’s blog has a post from an adoptee writing about how her feelings about “Gotcha Day” have changed over the years. This entry was posted in Uncategorized and tagged What I'm reading on March 15, 2017 by minefam. 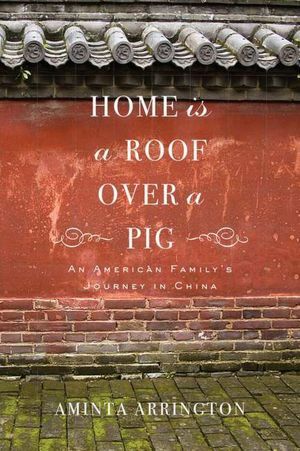 One book which I have seen recommended several times in the Chinese adoption groups is Home is a Roof Over a Pig by Aminta Arrington. I picked it up at my local library. It turned out to be one of my favorite reads in this genre. Aminta writes about how she and her husband decided to adopt a daughter from China after having their first child, a daughter. While they were waiting, they had a son. In 2003, they received the referral for their daughter from China. A few years later, they decided to move to China. Arrington’s book is a memoir of their first two years in China. This is really a combination of what I liked best about Dreaming in Chinese (my review here) and Awakening East (my review here). Like Dreaming in Chinese, Aminta shares how her quest to learn the Chinese language helps her to better understand the Chinese people and culture. The title refers to the Chinese character for home, which is a roof over the character for pig. Learning the Chinese language, especially the characters, gives her insights into her host culture. Amina is also very interested in the Chinese educational system. She teaches university students English at the same time that her three young children are being immersed in the educational system at a local Chinese kindergarten. She shares the strengths and weaknesses that she observes as both a teacher and parent. The Arrington family continued to live in China for many years. I couldn’t help but marvel at the wonderful opportunity it was for her children to become bilingual by moving there at just the right time for them to begin in primary school. Aminta is a keen observer, both of others and within her own family. She narrates the process of acclimating to the foreign culture. She honestly describes a time when she and her husband realized they had somehow taken the habit of using the adjective “Chinese” in a negative way, as well as their awareness of how it might impact their daughter adopted from China. Throughout the book she relates Chinese cultural habits in a way that always treats them with respect and humanity, unlike other “I lived in China” memoirs which can slip too easily into “Let me tell you how crazy everyone here is.” There are plenty of humorous stories included. 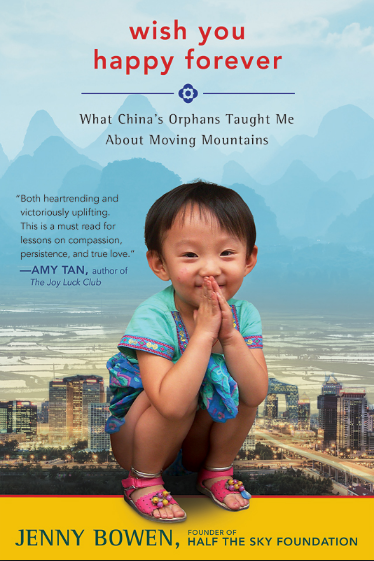 The other China related book I read during my break was The Heart of an Orphan by Amy Eldridge, founder of Love Without Boundaries. I absolutely loved this book. However, I can’t say that I couldn’t put it down because I couldn’t read more than a couple of chapters without needing a break. Amy’s book is basically a collection of stories about children she has known through her work with Love Without Boundaries. It’s the heartrending emotional rollercoaster that you would expect. Each chapter also tells some part of Amy’s story of how Love Without Boundaries grew, but also her personal growth. I really appreciated her nuanced discussion of sensitive topics. She discusses how her view of parents who abandon their children changed as she worked to provide surgeries for children still in their birth families. How she came to recognize the adoptive parent preference for girls as she saw, over time, how the orphanages were filling up with boys but families did not step forward as quickly to adopt them. She even acknowledges the challenges of older child adoption while discussing the plight of children who reach the age where they are no longer eligible for adoption. I feel a little odd in writing such a short review for a book I want to rave about. It’s simply that it’s hard to describe it in the way it deserves. I think that Eldridge’s memoir, along with Jenny Bowan’s (of Onesky/Half the Sky) Wish You Happy Forever, should be required reading for those in the China adoption program. They are both far more relevant for families in the current process than the frequently recommended Silent Tears. This entry was posted in Uncategorized and tagged What I'm reading on January 11, 2017 by minefam. As National Adoption Month draws to a close, I hope that you have found my blog posts to be helpful in gathering information if you are considering or in processing of adopting through the China Program. Please feel free to comment or contact me to suggest other topics you would like me to write about on the blog. My son August will be having surgery tomorrow on his leg, so I plan on taking a blog hiatus for the month of December as he recovers and to better enjoy the holiday season with my family. I have gathered plenty of reading material for you in this post to tide you over until the New Year. Creating A Family has all the info on 2017’s Adoption Tax Credit. NHBO has a nice summary post of trust based parenting practices. Speaking of TRBI, Full Plate Mom recently attended a week long training session in Texas on TRBI. She has a post full of book recommendations for learning more at home. Elizabeth at Ordinary time has a post discussing how the emotional/developmental age of a child adopted at an older age will not match their chronological age. WACAP’s blog has a good look at post adoption services for their agency which includes a frank discussion of adoption dissolution. Kudos to them for discussing this taboo topic. Interestingly, Holt’s blog also ran a post on post adoption services in November, and birth parent search and reunion seem to be a smaller portion of their services than it is for WACAP. I think the amount of time they spend assisting adult adoptees with paperwork issues underscores the importance of adoptive parents doing their due diligence there. Both posts point are good reminders that you should ask a potential agency about their post adoption services. I’ve enjoyed several of Holt’s blog posts during National Adoption month. This one gives a nice overview of how care in China’s orphanages has changed over the past decades. This one gives advice on sharing photos of your child on social media before adoption finalization. The behind the scenes view of What Social Workers Actually Do was also interesting. You can read my own contribution of how we were matched with our son August here. Finishing up my agency blog picks, Lifeline’s blog has a great article Holiday Tips For Waiting Families which you will find helpful if you are adoption limbo during the holiday season. An essay on the pressures of being an only child in China in the Asian Times. Sixth Tone looks at the rise of pregnancies across China nine months after China amended the one child policy to a two child policy. Very interesting essay in Foreign Policy from an Asian American woman who relocated to Hong Kong for several years. The South China Morning Post writes that the latest government figures put the population of “left behind” children in China at almost the same amount as the total population as Britain. Sixth Tone has an article on the lack of palliative care in China for the many children in the care of the state who have terminal illnesses. An adult adoptee discusses her changing perspective on her adoption with a friend who is also an adoptee from China. China Highlights, a guide service, has a good page on cultural taboos to be aware of before traveling. Media artist JT Singh has created a 3 minute ode to Shanghai which is beautiful and fascinating, if somewhat dizzying. This entry was posted in Uncategorized and tagged What I'm reading on November 28, 2016 by minefam. 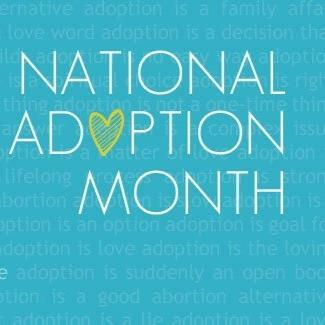 It’s been about three years since I posted my top adoption resources, so I thought it was time to update that post for National Adoption Month. I’ve read a whole lot more adoption books since then! Reminder: I’m not an Amazon affiliate, so when you see a link for a book, it just takes you to an author interview or a book review. You can order them through Amazon using the Love Without Boundaries affiliate link. Baby We Were Meant For Each Other. Simon writes the story of he and his wife’s adoptions from China, but he also includes the narratives of several other families so that a wide variety of adoption experiences are included. Simon adopted back when adoption from China meant healthy infant girls, so keep in mind that his experience is not going to be typical of today’s China adoptive parent. If you are an NPR fan, you’re probably familiar with Scott Simon of All Things Considered. No Biking In The House Without A Helmet by Melissa Faye Green is laugh out loud funny. While Melissa and her husband are probably not your average adoptive couple since they adopted mostly boys and older children, everyone can enjoy her humorous look at her large international family. She doesn’t shy away from reality though, talking about her difficulty in bonding with her first adopted son, the challenges of “virtual twinning” when they adopted a son the same age as a son already in the family, and even religious issues such as sitting down with the two older Christian boys they were considering adopting from Ethiopia and explaining that their family was Jewish. Melissa will really make you feel that adoption isn’t just for the super parents, but is something that even the average parent can do. I highly recommend getting familiar with the Creating A Family website. I listened to hours of podcasts from Dawn Davenport. I started with podcasts on how to decide whether foster, domestic, or international adoption was the best fit for us. I listened to a podcast on adopting when you already have biological children, toddler adoption, and how to consider which special needs to be open to. While we were waiting to bring Leo home, I listened to more specialized podcasts such as language development in internationally adopted children, feeding issues and nutrition in adoption, and bonding with your child while still in country. 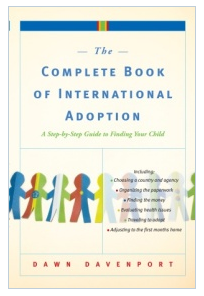 I Dawn Davenport’s book The Complete Book of International Adoption is a great resource if you decide that international adoption is the best fit for your family. Davenport is very systematic in taking you through the various factors to consider. She includes lots of narratives from adoptive parents, and I love that she always includes an even amount of pros and cons on issues like deciding if you should take your child(ren) with you on an adoption trip. Because this book is older, some of the country information is out of date but most of the information is very helpful, even if you know that Russian adoption is closed down for Americans. The Love Without Boundaries series Realistic Expectations and The Changing Face of China’s Orphans. Wish You Happy Forever– Jenny Bowen, founder of Half the Sky, writes the story behind the charity. Her experience adopting her daughter inspired her to change the way orphans were cared for in China, one child at a time. 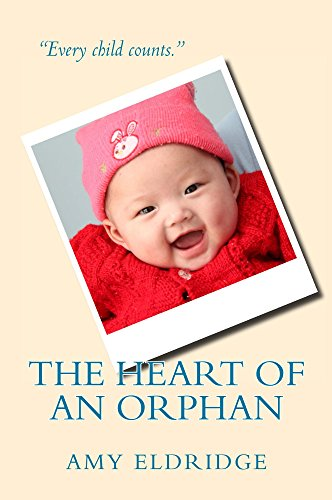 She writes about the changes in orphan care and population throughout the book. I was particularly shocked to read about the origin of the AIDS crisis in Henan, which I was unfamiliar with before reading the book. The Heart of an Orphan by Amy Eldridge, founder of Love Without Boundaries. I absolutely loved this book. However, I can’t say that I couldn’t put it down because I couldn’t read more than a couple of chapters without needing a break. Amy’s book is basically a collection of stories about children she has known through her work with Love Without Boundaries. It’s the heartrending emotional rollercoaster that you would expect. And, you know, my book. 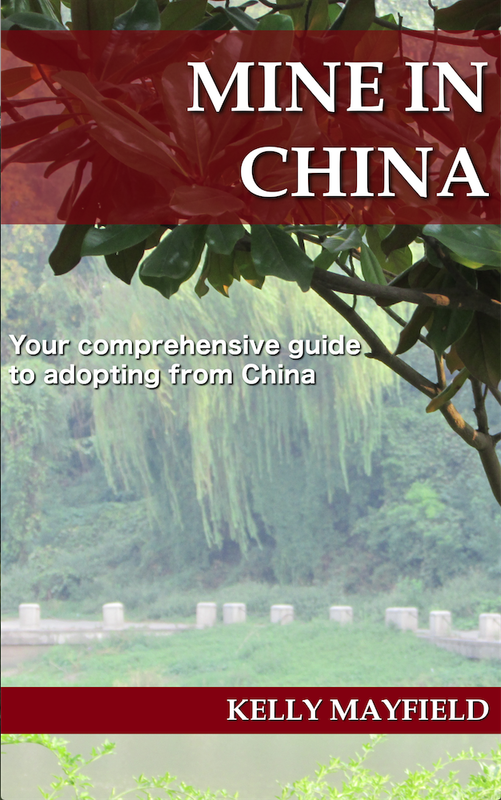 Which I always feel self-conscious about recommending but as far as I know it’s the only book that takes you through the process of adopting from China. 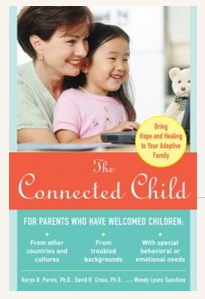 When parents in online adoption groups are asked for book recommendations, Karyn Purvis’ The Connected Child is always mentioned over and over again. Karyn wrote about her work with children “from hard places” and she was always in demand as a speaker at adoption conferences. Sadly, she passed away earlier this year after a long battle with cancer. The Empowered To Connect website is a wealth of information, with many videos and articles. I appreciated the science heavy information in The Connected Child which explained how things such as prenatal drug and alcohol exposure, trauma, or malnutrition cause chemical changes in the child’s brain. She gave many ideas on how to work through challenges, and many of them were very simple such as offering the child chewing gum because chewing reduces stress. EMK Press is another website with many good articles available. They offer a free ebook called Realistic Expectations which many adoptive families have found helpful. Attaching Through Love, Hugs, and Play by Deborah Gray gives practical advice on how to parent your child in a way which fosters attachment. Writing up a more in depth review for the blog is on my to do list. How To Talk So Kids Will Listen & Listen So Kids Will Talk is not an adoption book, but one I had on my parenting bookshelf already. I find it just as helpful for my adopted children as I did for my biological ones. I find that it goes hand in hand with connected parenting. When my youngest son was melting down multiple times a day because he was frustrated by not being able to communicate in English, I found myself making statements like “That must be really frustrating” or “You are really mad!” Now he has the vocabulary to share what he is feeling. He will say “Dat fwustwating” or more often “I MAD AT YOU!” This is a really easy to read book which will change your conversations with your children for the better. Love Me, Feed Me by Katja Rowell is a great book focusing on the many food related issues which can be a struggle for children adopted from institutions. Message from an Unknown Chinese Mother by Xinran- If you want the back story on how those lost girls ended up at the orphanage, this is the book to read. Xinran’s book is jaw-dropping and heart-rending, but keep in mind that she collected these stories over 20 years ago so they are not necessarily an accurate account of the situation in China today. Wild Swans– This is the story of three generations of women that span pre-revolutionary China to the 1980s. It is a real page-turner, but will help you to understand the various movements that occurred within the Communist era. It really helps you to understand the turmoil which went on for decades within China. If you read Wild Swans, read this article as a follow up to see the contrast between those born after 1980 and those who lived through all of the Communist era conflict and hardship. Home is a Roof Over a Pig by Aminta Arrington. This is my favorite in the “I went to live in China” memoir genre. Arrington is herself an adoptive mother. Allowing her two children from China to experience life in their native culture as well as to obtain Chinese fluency was a primary motivation in their family moving to China. Eating Bitterness, by Michelle Loyalka, is about China’s migrant workers. Unlike Factory Girls by Leslie Chang, this book focuses on the personal stories of migrants who are a variety of ages. Most are married, but a few are single. Some live with their spouse and child/ren while others are separated because of work. It is also a little unusual in that it is based out of Xian instead of Guangdong Province. Once again, there are the constant themes of the generational attitude differences and the rapid change in Chinese culture in such a relatively short amount of time. I think this book is a little easier to read than Factory Girls because of the variety of people and because, frankly, it was edited better. This entry was posted in Uncategorized and tagged Adoption Resources, International Adoption, National Adoption Month, What I'm reading on November 9, 2016 by minefam. Lucky number 13, just in time for Halloween! As an aside, I fixed several broken links in the adoption disruption blog post. One of the things that you need to be aware of as an adoptive parent is that when your child is outside of your protective family or community circle, he or she will be perceived as Asian. That sounds obvious, but many white parents assume that their child will never face discrimination or hear racist comments. The past couple of weeks have had some high profile discussion of how well accepted Asians are in America. Fox News ran a segment where Jesse Watters visited NY’s Chinatown supposedly to get the Asian opinion on the presidential election but was nothing more than a way to make fun of Asians through endless stereotypes. Shortly thereafter, an editor of the New York Times wrote about how a woman had shouted “Go back to China” at him when annoyed at his family on the street. The readers’ responses to that article poured in, painting a sad picture of how those sorts of comments are a daily occurrence to Asian Americans. PBS ran an interview with Gene Luen Yang, author of graphic novel American Born Chinese discussing his experience growing up as a Chinese American. While I have not read the graphic novel yet, this sounds like a great resource to share with an older child for discussion. Why Chinese Buy Trafficked Babies Instead of Looking in the Orphanage– Child trafficking does occur in Chinese adoptions but it is mostly contained to illegal domestic adoptions. Born In The U.S., Raised In China: ‘Satellite Babies’ Have A Hard Time Coming Home at NPR is a look at the flip side of the left behind children of migrant workers, those children of US immigrants or permanent residents who send their children to live with relatives in China so they can continue to work. Seriously Blessed posts an interview with her three daughters who were adopted at an older age discussing their thoughts on adoption before they were adopted. This is a wonderful resource for anyone considering older child adoption. Elizabeth at Ordinary Time writes a letter to the new adoptive parent from her perspective as an experienced adoptive mom. The Holt blog featured a post on how to advocate for your older child to receive the ELL services they need at school. This entry was posted in Uncategorized and tagged What I'm reading on October 13, 2016 by minefam. I’ve done a couple of book reviews over the summer, but I haven’t done an article collection since May, so I’ve got a lot to share with you. Priceonomics has a long articled called Why Did International Adoption Sudden End? which looks at a variety of factors for why international adoption has dropped by 75% in the past 10 years. I feel it is due to the fact that most country programs are now for older children or children with special needs. The article does mention the reasons why the young healthy infants are no longer available. From Sixth Tone, an article looking at how the city of Chengde could serve as a model for the problems resulting from plummeting birth rates facing China in the future. The Atlantic published a similar article called China’s Twilight Years. From Creating A Family, a summary of research on the mental health of adoptees. That’s magazine has an interesting infographic on the many different languages and dialects spoken within China. Somewhat related, the LA Times ran a feature on why it is really hard to learn Mandarin. It includes information on standardization of the language and why even native Chinese are forgetting how to write some characters because of technology. Financial Times author Patti Waldmeir moved to China with her two daughters adopted from China. She pens a nice essay sharing some memories of their time there together. Foreign Affairs publishes a look at the hard toll the one child policy took on Chinese mothers. An article from last year, but still extremely good if you are unfamiliar with Chinese government, the New York Times published an in depth look at how the Cultural Revolution shaped Chinese President Xi Jinping. The Telegraph has a lovely photoessay showing outfits children were wearing when they were adopted from China. The Daily Mail features a photoessay on a family in New York’s Chinatown showing their life over a decade in a tiny 350 square foot apartment. The Guardian shows pictures comparing various cities in the Pearl River delta area of China (like Guangzhou) before and after development. Becky, at Full Plate Mom, looks at adoption ethics in light of her 15 years of adopting. A great book list at NHBO giving books to help teach your child in a variety of different areas. This entry was posted in Uncategorized and tagged What I'm reading on August 8, 2016 by minefam.